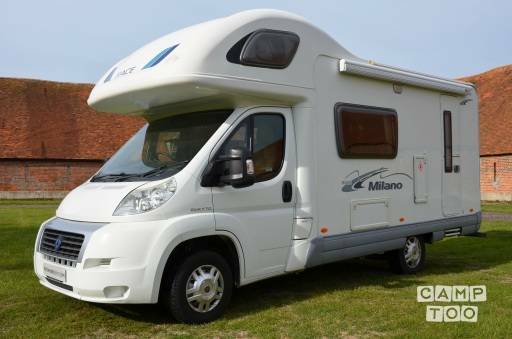 Spacious and comfortable 5-berth 2009 Ace Novella Milano with end kitchen. Various ways of utilising the living space to create more sleeping space - overall, 5 can sleep in comfort. The end kitchen is fitted with an oven and grill with gas and electric hob, 3- way auto select refrigerator, and sink. Truma gas and electric heating and hot water with blown air vents, a Washroom with WC, washbasin with vanity unit and also a shower divider, electric step, rooflight, blinds and fly screens, and concertina cab blinds. There is also a bike rack, a Fiamma ZIP awning, and a tow bar. House Rules inside the vehicle. Hershel the 6 birth Motorhome, Large lounge with TV and Xbox.